"A muscular, often funny book accessible to any lay reader... a bracing portrait of Las Vegas’s architectural arms race"
"A tour of the Las Vegas Strip that is erudite, entertaining, and impossible to conduct in person... Al’s Las Vegas is a story of the American national identity." "Truly understanding the state of the United States could begin by dissecting Vegas." "The spotlight is on the architecture, but Al also delves into Las Vegas's impact on other cities... Highly recommended. All readers." "The Strip is a well-told piece of narrative research that should grip both design and those who relish tales of capitalism and culture"
"Al keeps the book moving with anecdotes and insights that may take readers by surprise." "The Strip is a well-researched, well-organized, and important text... valuable to anyone who wants to understand or manage urban areas in the twenty-first century." "Stefan Al looks beyond the Strip’s surface to explore multiple transformations from desert outpost to international mecca." "A new visitor to Las Vegas... can't help but be overwhelmed by the mélange of architectural styles thrust cheektojowl against one another. 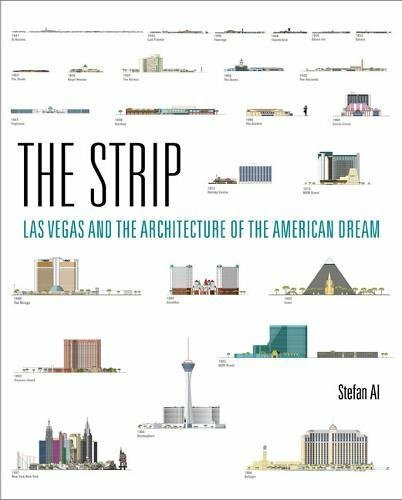 Fortunately, Dutch architect Stefan Al is here with a new book, The Strip: Las Vegas and the Architecture of the American Dream, to unclutter the seeming chaos." "A chronological journey of the Strip from its beginnings as a false-front Western town in 1941 to the hot neon lights of the 1960s, the Disneyland-like entertainment of the 1980s, up to the serious architecture of today... an enjoyable read." The Las Vegas Strip cast itself as the Wild West, with saloon doors and wagon wheels, and decked itself out in midcentury modern sleekness; it installed twenty-story high neon signs, then junked them. Then came Disney-like theme parks featuring castles and pirates, followed by replicas of Venetian canals, New York skyscrapers, and the Eiffel Tower. (It might be noted that forty-two million people visited Las Vegas in 2015—ten million more than visited the real Paris.) More recently, the Strip decided to get classy, with casinos designed by famous architects and zillion-dollar collections of art. Las Vegas became the “implosion capital of the world” as developers, driven by competition, got rid of the old to make way for the new--offering a non-metaphorical definition of “creative destruction.” In The Strip, Stefan Al examines the many transformations of the Las Vegas Strip, arguing that they mirror America itself. The Strip is not, as popularly supposed, a display of architectural freaks but representative of architectural trends and a record of social, cultural, and economic change. Al tells two, parallel, stories. He describes the feverish competition of Las Vegas developers to build the snazziest, most tourist-grabbing casinos and resorts--with a cast of characters including the mobster Bugsy Siegel, the eccentric billionaire Howard Hughes, and the would-be political kingmaker Sheldon Adelson. And he views the Strip in a larger social context, showing that it not only reflected trends but also magnified them and sometimes even initiated them. Generously illustrated with stunning color images throughout, The Strip traces the many metamorphoses of a city that offers a vivid projection of the American dream.